One sure fire way to save money is to bring your own lunch. Crustless zucchini quiche is a seasonal dish that's works great as a packed lunch. 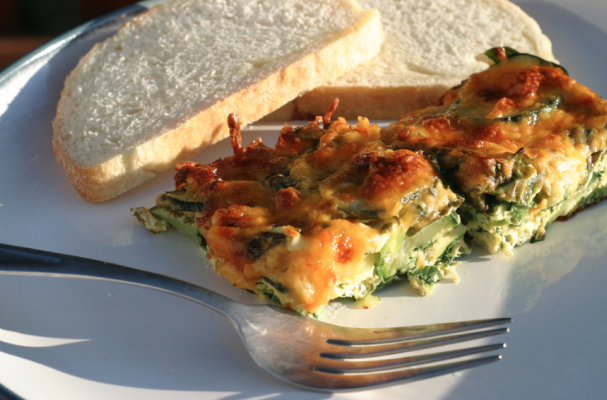 Eggs, cheese and sliced zucchini is arranged in a baking dish and cooked in the oven until the eggs have set. You can do an infinite number of riffs on this recipe and it can change with the seasons. For meat lovers, feel free to add crispy bacon, crumbled Italian sausage or browned Spanish chorizo to the mix. This meal is also a hit with kids so you can sneak it into their lunch boxes too.